When taking up any sort of winter mountaineering, ski touring, or hill walking that requires you to cross glaciers or steep ice one of your most essential safety instruments is a good ice axe that is suitable for mountaineering. Ice axes provide a very useful third point of contact (in addition to your two feet) in the snow or ice, so they can reduce the risks of you falling. Even more important is the fact that an ice axe will allow you to self-arrest if you fall. This is a short and quick way of saying “stopping yourself from sliding down the mountain by digging the pick of your ice axe into the snow or ice”. The third important function of a mountaineering axe is that it can also provide a good anchor point to belay a rope from. In non-technical terms this means that you can plunge the shaft of your ice axe into the snow to get a solid grip around which you can wrap a rope. This is important as a preventative safety step if you need to secure someone who is about to do a risky manoeuvre or as an emergency measure to stop the fall of someone on a rope. More than a few lives have been saved over the years by quick thinking mountaineers who have quickly plunged an ice axe into the snow and secured a rope to it when their companions on the other end of the rope have fallen. And a further, but still important use for an ice axe is to chop steps in steep snow. This is done using the adze (the flat bit at the back of the head) and allows one to cross short stretches of steep ice or snow without having to put on crampons. What is a Mountaineering Ice Axe? Modern mountaineering ice axes differ from walking ice axes in that they are generally (but not always) a bit shorter. They will also often have a slightly more steeply angled pick on the head, which is better for biting into hard ice, but it should not be too steep. They will often also have a slight curve to the shaft to make it a bit easier to self-arrest. But these differences are not necessarily that pronounced and in fact a classic alpine ice axe will often look a lot like a walking ice because the boundaries between the two are a bit blurred. One distinction that could be important is the strength rating of the axe. Most walking ice axes are rated B (for basic). This means they are strong enough for general walking and non-technical climbing. Ice climbing tools are usually rated T (for technical) which means they are somewhat stronger. In the middle is the mixed ground of mountaineering and alpine ice axes which come in both B and T ratings. This reflects the fact that they are often used for both purposes. In general it probably makes sense to go for the T rated axes as they will have a stronger pick that should last longer. They will also have stronger shafts so you can belay off them with more confidence. There is an incredibly wide range of mountaineering ice axes available, partly because they fit so neatly in the middle of the range of mountaineering activities. On the one hand are light or ultralight weight axes that are suitable for walking and light climbing yet that also get pressed into service on very high peaks because they are so light. On the other extreme are the really short axes with aggressively angled picks that start blurring the line with technical ice climbing tools. So try to find one that fits the sort of climbing you are planning to do. 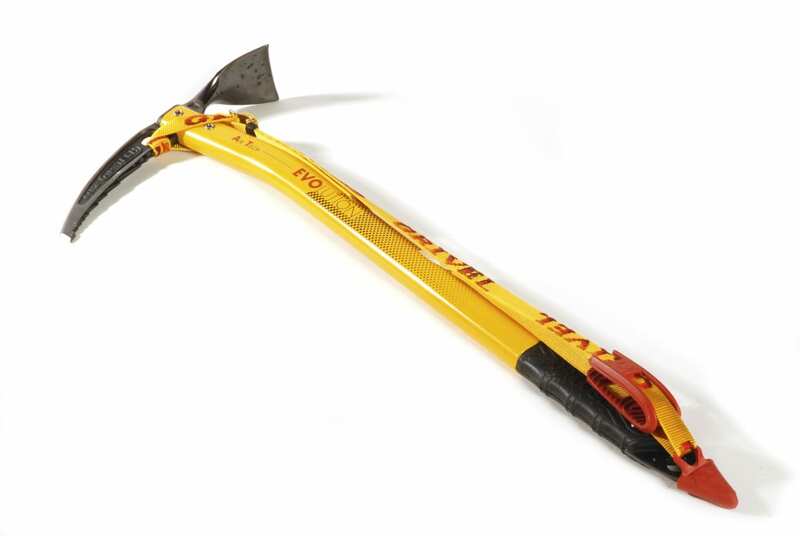 A good T-rated mountaineering axe should serve you well for most purposes provided it is a comfortable length. Much is written about the perfect length with much disagreement between those who think ice axes should be long enough for comfortable walking and those who think that 55cm is about as long as they should ever get, even for people who are over 6 feet tall. Without getting too far into the debate (see more of it on the section on walking axes) I tend to think that for a mixed-use mountaineering axe you can happily go for something that will dangle a few inches above the floor when held by the head. Anything longer becomes a bit clumsy on steep slopes and anything much shorter starts to feel a bit too much like an eating implement. Below are some popular mountaineering ice axes. Black Diamond’s Raven is a. great classic that blurs the lines between a walking ice axe and a mountaineering ice axe. It has a straight shaft and a strong head but only a B-rated shaft in a reasonably-priced package. 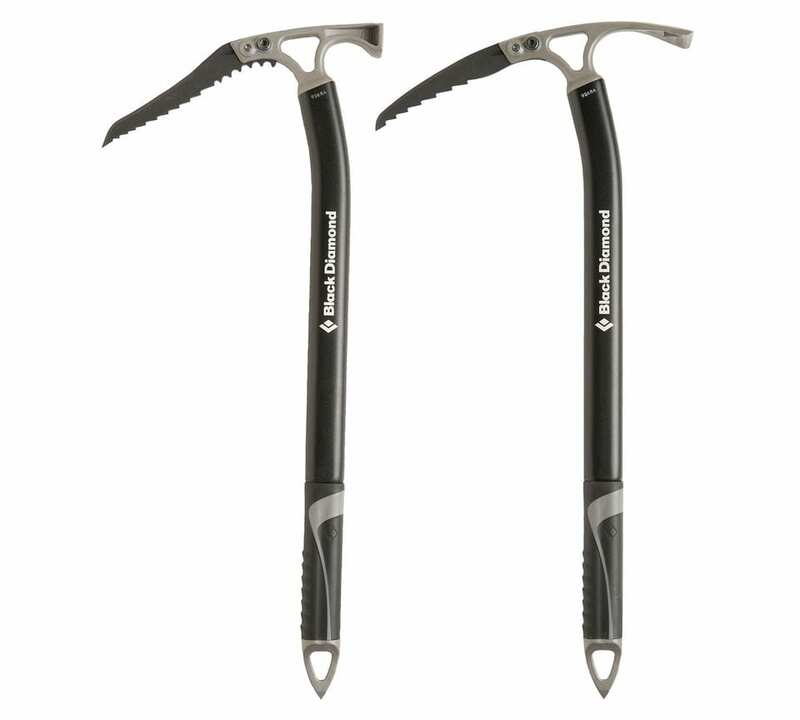 A step or three up into the more technical sphere is the Black Diamond Venom ice axe. It blurs the boundaries on the other end as it has a much more aggressive pick or you can get one with a hammer. It will do a good job of helping you self-arrest as well as help you over some steep sections of ice. This is my ice axe of choice though it may be hard to find anywhere but the UK as it is made by a small Welsh company. It is light, strong (T-rated shaft) and really comfortable for mixed walking and some steeper ascents. It also comes with a leash and is pretty reasonably priced. www.spadout.com Tips on how to select an ice axe.